I would like to invite the readers of Cakes For Conor to participate in this year’s Baked With Love Day on Sunday. The idea is to take time in your own homes to bake in memory of loved ones who have died. You then share the bake along with stories and memories of loved ones with family and friends. If you wish to take part I invite you to like the Facebook page below. It’s my wish for Conor’s legacy to be that of remembrance. I have witnessed many bereaved people get upset that none of their family & friends talk about their loved ones who have died. My thoughts are that we, the bereaved need to talk first to show to others that we want to talk. While I wish there wasn’t, there is still so much awkwardness around death in society. I hope that this day will give bereaved people “permission” to talk and a context in which they can be heard and can connect with others. It is generally accepted now that talking is healing. The bereaved shouldn’t feel pressured by society to stay quiet. We can and do move forward in our grief and in our new lives by finding ways to honour those we miss. This is the second year of Baked With Love Day. There were many family and friendship groups who spent a special day remembering their loved ones last year. They posted photos of their bakes and told us who they were remembering. One friend told me that there is so much sadness linked with anniversaries that she found this day gave her a chance to share happy memories of her cousin. A bereaved parent has said that remembering her son over cake will be easier than at the graveside for her younger family members. Another parent plans to make it a fun way for his surviving children to talk about their brother. Please like the Baked With Love page and share with anyone you think would like to take part. Together we can spread the word of remembrance. Our loved ones may be gone but our love for them can live on in our memories. Happy birthday to you. Can you believe it – 3 years!! That’s a whole extra finger to hold up Conor. ‘Three’ is a much harder word to say than ‘two’ but I’ll help you. This year we’re missing not just a son but also a big brother and I have found your 3rd birthday even harder than the first two. We had a special day to celebrate your little life. 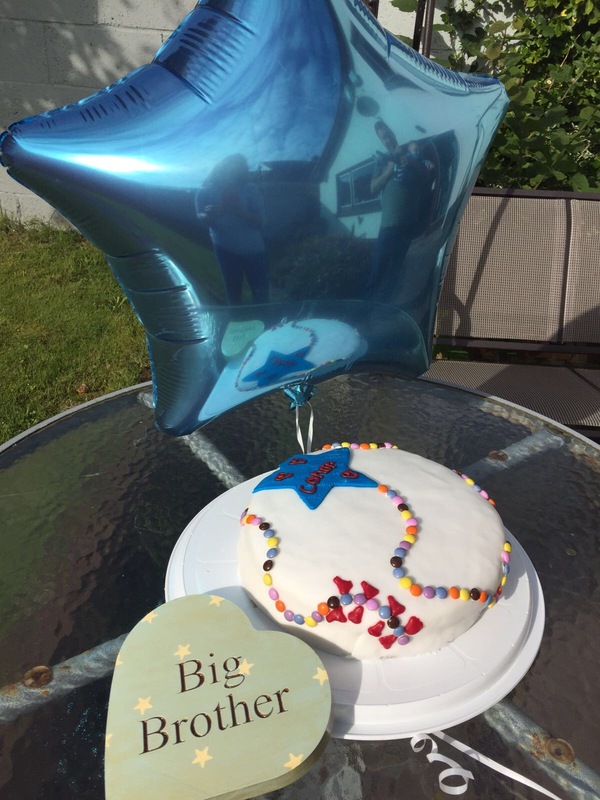 We got you a blue star balloon, new plants and Mummy lovingly gave 3 coats of varnish (one for each year) to the Big Brother plaque that your fairy godmother had made for you. We wrote your name on the beach we took you to on the day of your funeral and ate birthday cake (there’s always cake) with your grandparents & Auntie. 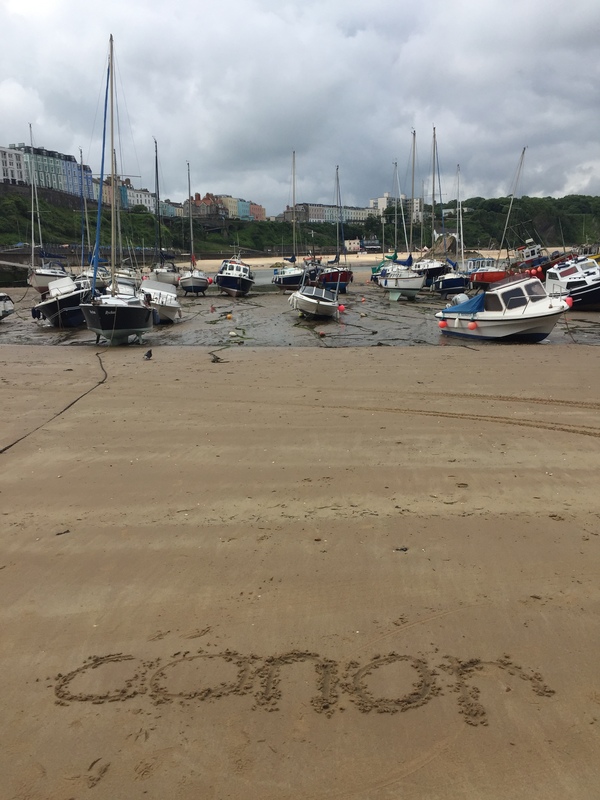 Lots of people sent us messages and others wrote your name in the sand too. It lifts my spirits to have you remembered in this way. We are finding ways to include you in our little family. Your little brother looks at your pictures, hears your name, visits your grave and pulls at my star necklace (my lovely niece says that’s how he can touch and play with you). I continue to be your over protective Mummy Conor. I include you in conversations so everyone knows I’m a Mummy to two special boys. Can you believe it; we made it into a national paper? Here’s our Irish Independent article…. You won’t know this but when I was a little girl I wanted to be a writer as I used to love writing stories. I could never have imagined that one day I’d be in the paper for writing our own story. 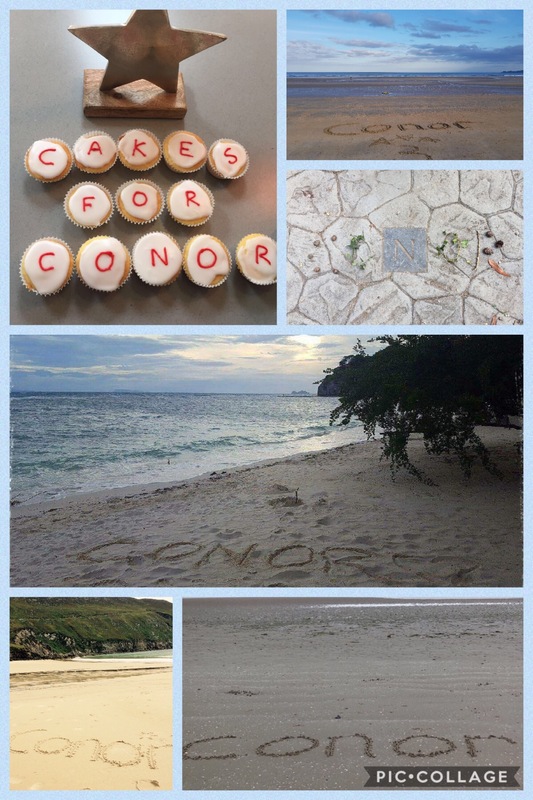 What an adventure we have had travelling the world Conor. Together we have touched down in 84 countries! 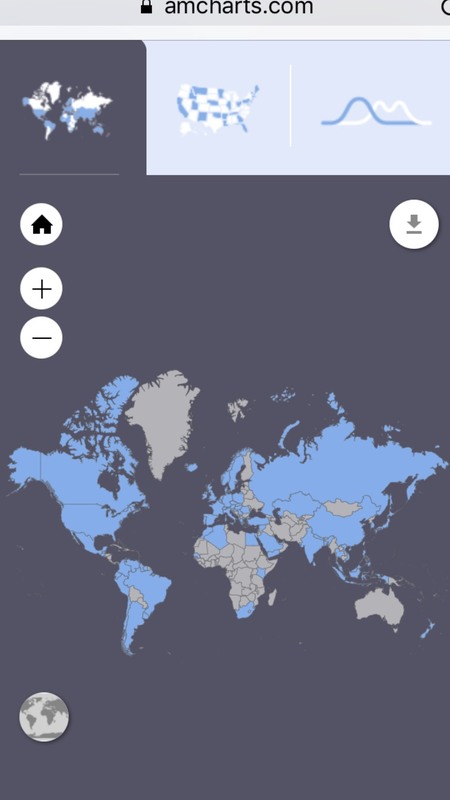 I can’t believe that Cakes for Conor has had been read in so many places (in blue on the map). You are world famous my darling boy. When you were growing inside me I always hoped you’d have a curiosity about the world and a lust for travelling. We had the first “Baked with Love Day”. People baked cakes and shared them with family and friends to remember people who have died. We remembered you and Grandad John with our friends. We’re going to have another day later this year. Mummy wants your legacy to be one of remembrance. It’s easier to move forward by remembering. Your little brother and I have set up a Rainbow Baby & Parent Group. I do the bad singing and he does the giggling. We fly past your star in the “Zoom Zoom Zoom, we’re going to the moon” song. We get the chance to eat cake (!) and talk about all our children at it. It’s the first thing I have done where I feel like I am giving time to both my special boys. We are days away from the anniversaries of both my Dear Dad & Conor. Without checking today’s date I can feel my mood changing. One minute I’m crying, next I am cranky and then I am ok again. This cycle repeats itself throughout the day and has left me exhausted. It is like my wellbeing is in synch with the change from sunny to showery weather conditions. These are days I want to simply get through yet they are lives I also want to celebrate. Time is a strange concept. It’s 3 years since Conor lived and died. Sometimes those three years can feel like just 3 days ago while simultaneously they can feel like a lifetime. I am getting closer to accepting his death without constantly questioning “why?” There remains a sadness and a Conor shaped hole in our lives. There should be a 3 year old boy getting excited about his birthday. There should be a 3 year old boy requesting a cake decorated with his favourite character. My memories of Conor are becoming more hazy over time. I am also struggling to picture what he might look or be like as a 3 year old. Like other bereaved parents, I grieve the future that we’re not getting to have with him. In the absence of more tangible memories, I cling onto Conor’s name. 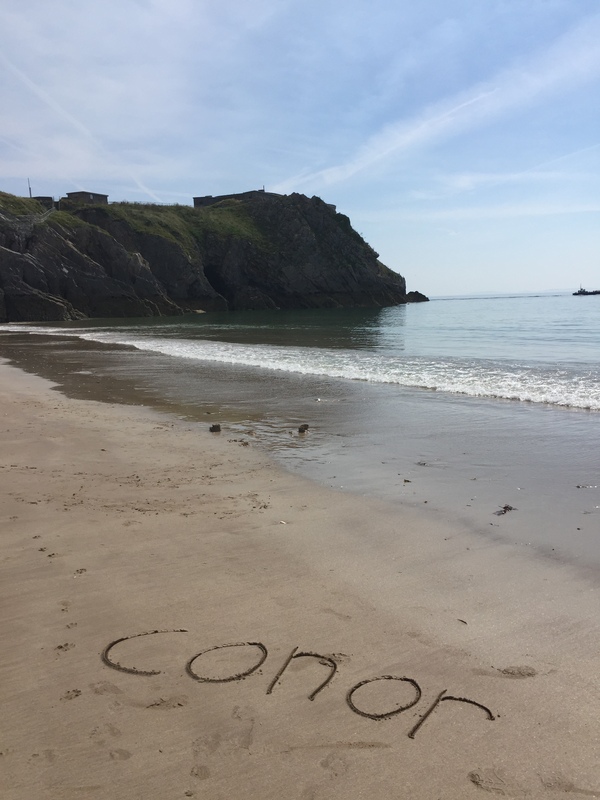 Holidays are spent writing Conor on new beaches. 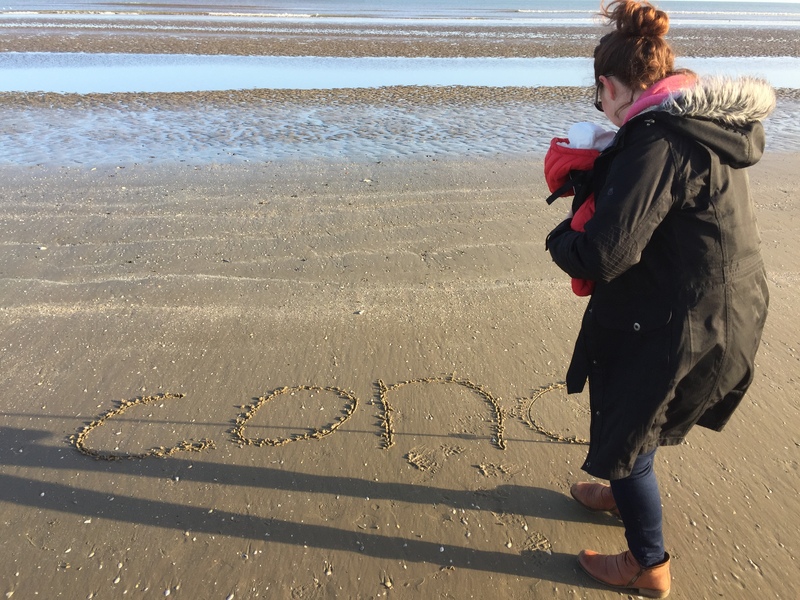 His name spoken or written by others tells me that while specific memories may be fading, Conor is a little boy whose life mattered. This year we will mark both days. “Dad Day” is one of remembrance. We’ll spend the day doing things Dad liked to do when he came to visit. We’ll attempt to complete the Irish Times crossword over a pint in one of Dublin’s old pubs. We’ll raise a glass to my Dear Dad and our boys’ Grandad John. I’m never quite sure whether to refer to Conor’s day as his birthday or anniversary. The two events are wrapped up in one day. In the spirit of a birthday I’ll make a cake for Conor (watch this space for a photo). We’ll visit and tidy his grave before writing his name on the beach. In my head I have been thinking of all I would like to say to both my Dear Dad & Conor but my words don’t yet do it justice. I miss them terribly and I love them to Conor’s star and back. I hope they would be proud of their daughter and mother for their presence and absence in my life has shaped me into the person I am today. Currently the news seems to be full of stories of people being murdered while going about their everyday activities. Tourists and workers have been knocked down by vans. People having a Saturday night meal are being stabbed. Young people going to concerts are victims of homemade bombs. Attacks come with no warning and lives are changed forever. I can no longer watch the news as simply a spectator. I now “feel” the news. I am taken back to my “Bad News Day” and one by one feelings of shock, fear, anger, loneliness, sadness wash over me. I cry for those left behind. I picture families getting the calls no one ever anticipates receiving. I can’t possibly know what it must feel like to lose someone to such a violent death. However, I know the pain of a sudden death and the loss of a future. I know that while time helps, that pain will never go away. People are shocked by such events. They become topics of conversation in homes and staff rooms. People are quick to say that we cannot let terrorists win. They announce that we have to choose love and not fear. It must be “Business As Usual”. I say it’s very easy to speak this rhetoric when you haven’t been directly affected by the loss. Of course the general public need reassurance but sometimes I wonder if it comes at the expense of the bereaved. By now I have got to know a number of bereaved people. One thing all of us have had in common (regardless of the circumstances of our loss) is a sense of isolation that comes with knowing our lives have come to a standstill while life goes on all around us. W. H. Auden’s Poem “Stop the clocks…” words this perfectly. I think regularly of those left behind from such public deaths. I wonder how they feel as the world around them rushes to get back to business as usual. I hope they are not alone as their own lives fall apart. I hope their loved ones are remembered for their lives and not just their deaths. I hope they know that right now it’s ok to feel shock, fear, anger, loneliness, sadness, anger and to not always choose love. I’d like to tell you about a very special encounter I had last week. Conor’s little brother and I were out getting our groceries when we bumped into a lovely woman I used to work with (let’s call her Anne). While catching up over a cuppa and cake we met another woman (let’s call her Lucy). Lucy and Anne used to be neighbours. While they were exchanging news, Conor’s little brother was sitting on my lap smiling away at his new audience. Lucy asked about my little smiler before telling me to treasure every single moment with him. There was something about this woman that made me go on to tell her about smiler’s big brother. The moment I did her eyes watered and she told me about her own little girl who was stillborn. Her daughter would be now be 27 years old. Our stories (despite being 25 years apart) were identical. There we were, two strangers connected by love, loss and tears. Lucy told me that the loss of her daughter was a pain like no other. While time has made it easier she said she’ll never forget her little girl. Lucy’s family continue to talk about their little girl. Her surviving children write her name on cards. This was all music to my ears as I contemplate a future with time slipping away from Conor’s little life. I have often wondered if my grief is visible to others. I look in the mirror and see a changed woman since Conor lived and died. Looking back at this encounter, I wonder if I saw something in this woman that lead me to open up to her. Maybe those of us who have known such love and pain can indeed spot it in others. I would like to dedicate my latest pink bake to a little girl called Rebecca who is loved and missed by her family. The Battenberg cake has been on my to do list for ages. It’s a winning combination of sponge & marzipan. I had put it off believing it to be a bit tricky but it’s much easier than it looks. It’s way nicer than the shop bought ones I remember from childhood. Maybe next time I’ll master squares instead of squashed triangles. Always use gel food colouring rather than the cheap liquid colours. The gel won’t change the consistency of your cake batter. I want to write about something wonderful that happened yesterday. We brought Conor’s little brother to visit relatives. He cried when someone other than us, his parents tried to hold him. While he was happy to smile at anyone in view, he wanted to be in our arms. This is the first proof we have that he feels safe and content with us. He knows that his Mummy & Daddy are special to him and this is the most amazing feeling. In the weeks after Conor died we walked to try to pass the time. There was one day I heard a young child call for his mother. It felt as though someone was ripping my broken heart from my body. Hearing “Mummy” directed at someone else hurt so much. I was a Mummy too but there was no living child going to call or need me. I still cannot imagine anything worse than losing a child. Regardless of how many children a family has, the loss of a child/sibling leaves a gaping hole in a family and a lifetime of sadness. However, when it’s your first child who dies you’re also faced with a very real fear that you may never get to be parents to a living child. For a long time after Conor died I struggled to be around families. It hurt so much seeing the special relationship between parents and their children. Each “Mummy” stung and left me feeling so empty. I was a Mummy too but my child was in the ground rather than playing by my feet. Other than immediate family (with whom I already had a special role as Auntie) I avoided being around friends or extended family with their young children present. I made a decision to be gentle with myself. If it caused too much pain or anxiety I avoided the situation. I came across a bit of criticism for this but life was hard enough without adding to it. It has meant I missed out on meeting new babies born in this time and missed significant milestones with others. However, it’s what I needed to do to survive. I continue to miss Conor and I think of him every minute of every waking hour. There is a two year old hole in our family which will never be filled. However, there is now a living little boy who helps makes this Mummy feel special. His presence in our lives is helping us to re-engage with other families. He is far too young to speak but one day I might just get to hear those very special two syllables “Mummy”. These are the Snowy Rocky Road bars I made when seeing my amazing sister over New Year. We both like white chocolate and when you add biscuits, marshmallows, dried cranberries and pistachio nuts the overall taste experience is incredible. I wanted to make something that would travel and last well (which these did; even surviving flight cancellations). I used gluten free biscuits so my wee niece could try them too. My amazing sister loved them. Many people are in the throes of their New Years resolutions. Gym memberships are up, shopping baskets are full of colourful fruit and vegetables and wine glasses are empty. Unfortunately we can’t live off delicious white chocolate rocky roads all year!! For the most part I have had a healthy relationship with my own body. My adult weight has rarely fluctuated and I can eat without calorie counting. While pregnant with Conor I watched in awe as my bump grew and grew. I was so proud of my expanding tummy and my B cup breasts. After Conor died I very suddenly had a complicated relationship with my body. I know from speaking to other bereaved mothers that I was not alone here. Within two weeks of Conor’s death I weighed less than my pre-pregnancy weight. Rather than feel proud that I fitted into my jeans I was heartbroken. I had no child at home and now my body showed not a single sign of ever giving life to my little boy. 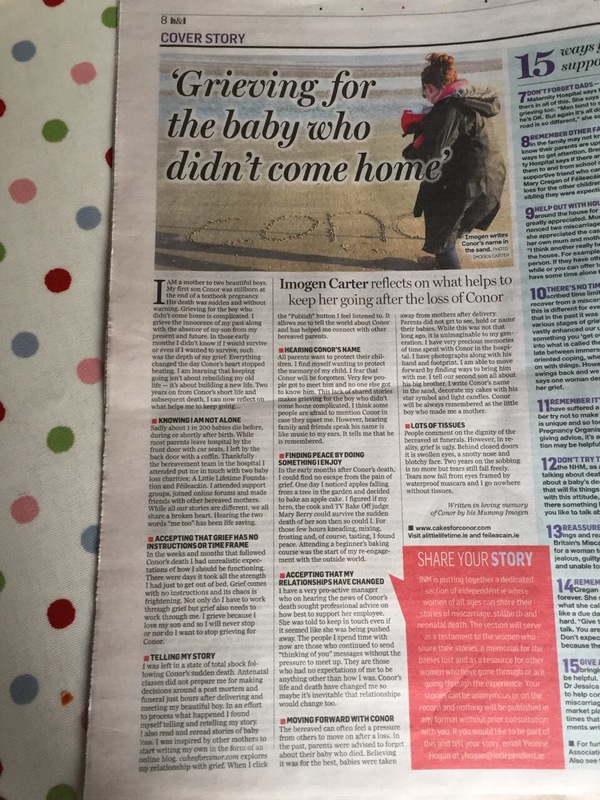 I had delivered Conor naturally so there was no caesarean section scar. There wasn’t a single stretch mark and my breasts had shrunk to their unimpressive A cup. It was only my feet that didn’t return to their original size. Yet all I had to show for being a mother was a shoebox filled with memories. I also struggled knowing that Conor had died inside me and that I couldn’t save him. Sadly lightening can strike when babies are meant to be in their safest place. In those early first weeks and months I had no appetite and only ate when food was put in front of me. For the first time in my adult life I hated seeing myself in the mirror. I looked like the person I used to be but I was no longer her. I know others who went the opposite way and over ate for comfort. One Mother said she ate lots to try to keep her bump as she had loved her pregnant body. The pressure in the media for Mothers to get their figures back after giving birth is enormous. At this time of year there are adverts everywhere targeted at new Mothers. There are diets and classes to help Mothers get back into their jeans. While I totally understand that people want to feel fit and healthy after having a child, this pressure angers me. The adverts nearly imply that these Mother’s bodies have been occupied by unwelcome visitors. Pregnancy and childbirth is a gift that not all women get to enjoy. Women should be proud of any lasting changes to their bodies. These tell the world that we are Mothers and that our children lived their lives (no matter how short) within us.